A pair of undefeated teams will meet in the second round of the 8-Man D-I playoffs when the top-ranked Burlingame Bearcats go on the road to face the West Elk Patriots. During the regular season, Burlingame outscored its opponents by a combined score of 534-20. The Bearcats shut out their opponents in seven of their nine regular-season games. The Bearcats captured the Lyon County League title with a 3-0 record. Last week, they opened the playoffs with a 34-24 win over Victoria, but all-state quarterback Dalton Sporing left the game just before halftime with an injury. Sporing missed time early in the season while in the final stages of recovering from a knee injury suffered last winter in basketball. Montana Giffin has played well in Sporing’s absence. The junior has passed for nearly 350 yards and nine touchdowns on the season. Junior Seth Greenwood has led Burlingame with 759 rushing yards and 16 touchdowns on 69 carries. Senior Caiden Musick is the top receiver with 19 catches for 430 yards and 12 TDs. The Patriots have scored no fewer than 36 points in a game and have allowed no more than 28. West Elk’s offense averages nearly 350 yards of offense. Senior quarterback Cade Miller is a dual threat with 977 passing yards and 17 touchdowns along with 1,202 rushing yards and 24 touchdowns on 129 carries. Junior William Silvey has rushed for 800 yards and 13 touchdowns on 126 carries. Burlingame is aiming for the state championship this year after falling in the state semifinals a year ago. West Elk also started the season 10-0 in 2015 but fell in the second round of the playoffs. For the fourth straight season, Central Plains and Spearville match up in the second round of the Eight-Man, Division I state playoffs. In ’14, Central Plains won a classic, 42-40, at home and went on to capture the state title. In ’15, Spearville defeated the Oilers at home, 58-28. Last season, Spearville jumped out to a 30-0 lead after the first quarter and won 58-26 in Claflin. Central Plains, Spearville and South Central are the only Division I teams to reach the playoffs in the last four seasons. The trio has all made the postseason in the last five falls and all advanced to the quarterfinals for the second straight season. Spearville is 10-0 this year, 34-1 since the start of ’15 and 44-2 since the start of ’14. Central Plains is 41-4 in the last four years. The Oilers were preseason No. 1 this fall and then opened with a 34-8 home loss against Victoria in a game that was primarily played Saturday because of weather. Since then, Central Plains, unranked until this week, has rolled and picked up quality wins, including at Ness City (44-20), versus Otis-Bison (36-12) and at Little River (52-12) in districts. All three teams made the playoffs. 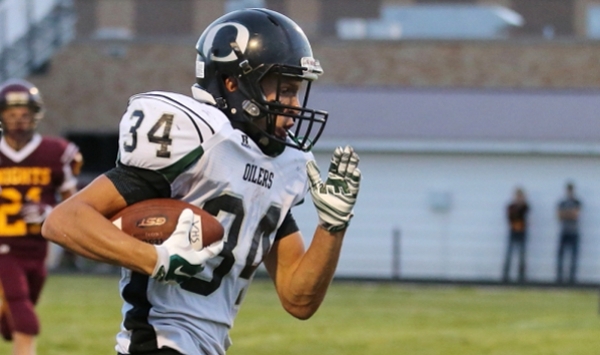 Last week, the Oilers dispatched Macksville, 58-12, in the first round of the playoffs. Spearville has had a similar resume, including a 42-20 win against St. Francis in the first round. The Lancers trailed 6-0 early and then scored 34 unanswered. The Lancers have a total margin of 524-96, while Central Plains is at 500-90. Quarterback Myles Menges, a transfer from Ellinwood, has completed 48 of 79 passes for 873 yards with a 19/3 TD/INT ratio. A balanced rushing attack has six players between 176 and 370 rushing yards, led by junior Alex Hickel. He has 34 carries, 10.9 yards a carry and 11 scores in just seven contests. Senior Alex Barton has 19 catches for 390 yards and eight TDs. The Oilers have nine turnovers and is plus-seven in turnover margin. The Oilers have averaged eight yards a play. Central Plains features 28 players and nine seniors. Last week, St. Francis had just 13 players dressed against Spearville, and the Lancers had a significant size advantage. Spearville, which lists 27 on the roster, has averaged 10.5 yards per play. Entering the Central Plains game last year, the Lancers averaged 10.2 yards per play. Spearville’s single wing has a brand-new offensive line, heavy with first-year seniors. Junior Kolby Stein is turning in one of the most efficient seasons in Kansas history with 32 of 35 passing for 794 yards with 12 scores against no interceptions. Senior Bailey Sites has 82 carries for 901 yards and 23 scores. Stein is at 72 carries for 539 yards and eight TDs. Senior Alex Fisher had several big plays last week, including the first touchdown, and has 23 carries for 300 yards and five scores. Spearville has seven turnovers and stands at plus-19 in turnover margin. Sites has five interceptions, including three last week. If Central Plains is to win the formula has to be similar to ’14: big plays in the passing game and win the turnover battle. Spearville’s defensive backs were outstanding against St. Francis all-state wide receiver Tate Busse last week, and they will get another test with Barton. Central Plains has the depth to match the Lancers, but Spearville’s offense is too explosive and consistent.